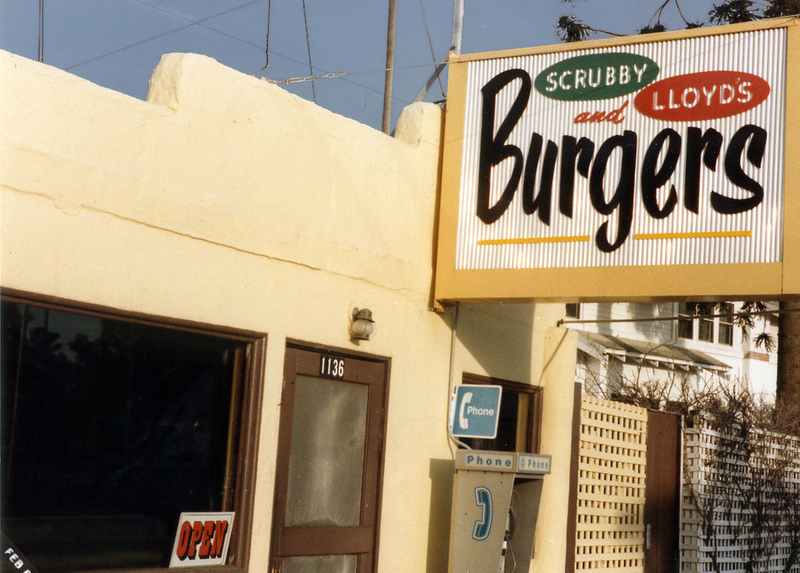 my buddy Bill Mulder sent me this photo of the old Scrubby and Lloyds hamburger joint here in SLO… long closed and torn down. It is raining today… and blustery… It sure would be fun to be able to go back to this place today… and sit at the big U shaped dinette bar… where everyone faces each other around the waitresses domain of milk shake mixers and potato chip bags on wire clip clamp racks. Usually a couple of old timers chatting at a booth around the edge… and a plethora of car mechanics and downtown business owners and the odd newspaper reporter hanging out. Phone booth out front… remember those… jeez… remember dimes for that matter. The cook… not sure if it was Scrubby… or Lloyd… usually gruff and unshaven in the back… ex navy maybe… I dunno. Big flat hamburgers.. No fries… only potato chips. a coke… or a milkshake. That was the sum total of the menu.